If you're nervous about an upcoming surgery, we know how you're feeling -- because we've been there too! Here, real people are sharing their personal experiences going through various types of surgery. See what to expect before you have laparoscopic surgery, thyroid surgery, carpal tunnel surgery, heart surgery, skin cancer surgery, knee surgery, a hysterectomy, and other surgical procedures. My husband received a melanoma diagnosis from a mole on his arm. You can see in his skin cancer photos how the mole grew and changed colors over 6 years. Here’s what we’ve learned about the best melanoma treatment options, what the melanoma stages of cancer mean, and what melanoma looks like. We hope you’ll find this information helpful if you or someone in your family is diagnosed with melanoma skin cancer. I had thyroid surgery. I had no idea what it would be like. So to give you a better idea of what to expect after thyroid surgery, I’m sharing my detailed thyroid surgery recovery story — complete with my thyroid scar photos and tips that I hope will help to speed up your thyroid surgery recovery time. I had a full hysterectomy at the age of 50, nine years after having a laparoscopy to remove endometriosis. 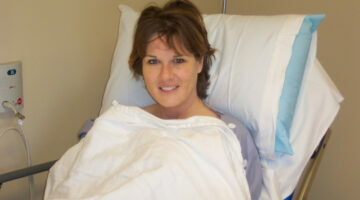 Here are my best tips if hysterectomy surgery is in your future. A LOT of my friends and relatives have had total knee replacement surgery. You probably have some fears about the surgery & questions about the recovery. Here’s what you need to know. I’ve had to deal with carpal tunnel for years and I’ve tried many carpal tunnel syndrome treatment options. My mother has struggled with it for years, and she recently went through the carpal tunnel syndrome surgery. So I am very familiar with this condition. Here’s my $.02 on surgery for carpal tunnel and other carpal tunnel treatments.